I was a little disappointed in this dish, which should have otherwise been a sweet and fruity, flavorful dessert. Personally, I don't think many desserts are good fried, and that's the main element that comes across with these wontons. Stuffed with a mixture of minced dried apricots, roasted cashews, candied ginger, and brown sugar, the wontons themselves are rather hard to work with. Beaten egg is used as the glue to hold them together, but this is not for the beginner cook. You'll need to have deft and nimble fingers to make sure these hold up, and you may also want to have some experience with deep frying (this was my first time!). The flavor of this dessert is interesting. The wontons stay very crispy, yet still seem "thick" and heavy with oil when you start eating them. I ate about three of them and felt...fatty. The apricots are tangy and go well with the spicy ginger, and the cashews add a nice crunch. 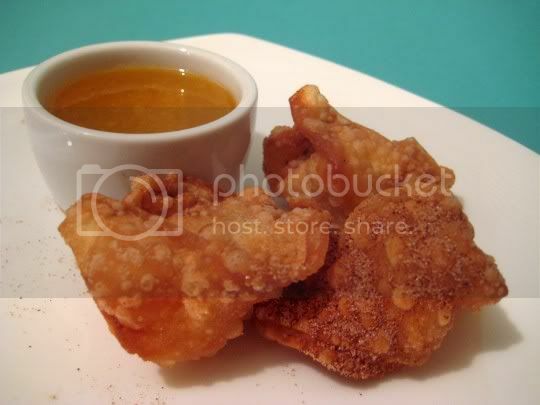 Cinnamon-sugar is sprinkled on the freshly fried wontons, so this adds more sweetness and spice. But dip them into the lemon-honey sauce (a simple mixture of fresh lemon juice, honey, and lemon zest), and this seems to overwhelm the flavor. The sauce is very VERY lemony. I almost think these wontons would be better and more dessert-like with maybe a caramel sauce. Surprisingly, the leftover wontons did not get soggy, and stayed very crisp and crunchy (stored at room temperature, in an airtight container after being completely cooled). Make again? Probably not. These are too heavy and greasy for a good dessert. The flavors are interesting, but it's not worth the trouble.